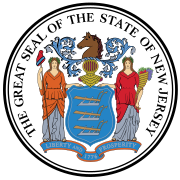 The 1934 New Jersey gubernatorial election was held on November 6, 1934. Republican nominee Harold G. Hoffman defeated Democratic nominee William L. Dill with 49.90% of the vote. ^ "Votes Cast for the Office of Governor of the State of New Jersey" (PDF). Secretary of State of New Jersey. 1934. Retrieved September 2, 2015. This page was last edited on 17 December 2018, at 20:42 (UTC).